Looking at magazines and tabloids you would think that cellulite is a horrible curse befallen on an unlucky few, but in actuality 80-95% of women have some amount of cellulite. And this is not just for the plus-sized ladies; thin women have cellulite too, and even after weight loss cellulite does not necessarily go away. Weight loss and muscle toning may certainly reduce the appearance of cellulite but there is no effective treatment that can eliminate it completely. However, that doesn't stop companies from trying. There are a myriad of creams, lasers, massage treatments, and diets that are all designed to help eliminate cellulite, many of them rather expensive. Instead of spending hundreds of dollars on these treatments, there is a simple, inexpensive and "green" way to reduce the appearance of cellulite that is found in just about every kitchen and break room everywhere: used coffee grounds. 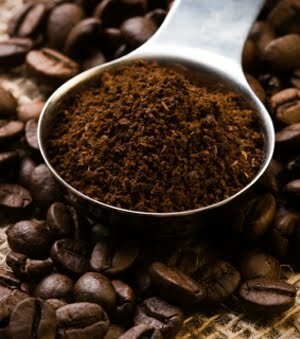 Caffeine is a common ingredient in many anti-cellulite creams and serums. Caffeine, when applied topically, works to temporarily tighten and tone the skin, reducing the appearance of lumps and dimples. Caffeine stimulates blood flow (while also constricting blood vessels) and has anti-inflammatory properties. However, it must be noted that caffeine taken internally can actually make cellulite problems worse due to it's diuretic properties. It is important for cellulite treatment, and for good health in general, to keep your body well hydrated and promote the elimination of toxins in the body. In order to do this simple and inexpensive treatment, take the coffee grounds from the coffee maker (don't use decaffeinated, of course), mix with approximately 2 tablespoons of olive oil, warm in the microwave for a few seconds (10-20 seconds only; you want it warm, not hot!) massage into the skin for 2-5 minutes, then rinse. You will want to do this in the bathtub or shower, as the grounds tend to get very messy. For extra effectiveness, wrap the areas in plastic wrap and sit or lie down for about 20 minutes, then rinse. Your skin will be soft and supple and over time it will temporarily decrease the appearance of cellulite. You may not see miraculous improvements instantly, but at the very least it is an effective exfoliator that improves the texture and appearance of skin. You are also recycling and reusing material that would otherwise simply go into the trash. ﻿I did the treatment a second time (as my parents supply me with limitless amounts of used coffee grounds), this time all over my body. My boyfriend even commented on how smooth and soft my skin was, officially making this a regular addition to my beauty regimen. Genius. I'll have to give this a go if we ever get a guest stay over who likes to drink coffee. I'll just say "it's for recycling" haha. Transitioning Methods: The results are in!